I get to play lead trumpet for an awesome band based out of Portland called TopHat. We play lots of funk and also like to arrange pop hits to feature the wide variety of instruments and singers that we have. This hip video was just released last week - a cover of Justin Bieber's "What Do You Mean?" Check it out! TopHat's cover of Justin Bieber's 'What Do You Mean?' Jimmie Herrod - Lead Vocals, Cassie Beucherie - Vocals, Julie Or - Vocals, Alex Koehler - Bass, Corey Foster - Drums, Steven Skolnik - Percussion, Ben Turner - Fender Rhodes, Rollie Wirt - Guitar, Josh Clark - Guitar, Tony Glausi - Trumpet, Noah Simpson - Trumpet, Kristof Schroeder - Flute/Alto Sax, Reid Neuman - Tenor Sax. Recorded at The Rye Room in Portland, OR. I have developed this exercise over the past several years while teaching students of varying levels the basics of improvising over chord changes. It is meant to be easily understandable and very quickly applicable to whatever tunes you are learning. To be most effective, this method requires only that you have a basic preexisting understanding of what 7 (or so) notes are appropriate for each chord you are dealing with. Extrapolation is a three-movement chamber ensemble work that I wrote to feature some of the remarkable trumpet talent at the University of Oregon. In the first movement you hear several motivic statements. The second movement begins with a free improvisatory duet, furthering these motives, and from there the piece unfolds as those original introductory melodies are developed. Read more about what went into this project here. Music composed and produced by Tony Glausi. Recorded at the University of Oregon. Trumpeters: Aaron Kahn, Tony Glausi, Casey Riley, Alexis Garnica, Hannah Abercrombie, and Luke Harju. Buy Identity Crisis NOW on CDBaby! Track 9 of Identity Crisis captured on video! Josh Hettwer-tenor sax / Torrey Newhart-piano / Sean Peterson-bass / Adam Carlson-drums / Cyrus Shiva-video. Even in tragic times like these, there is always hope, and to help spread this simple message I have recorded a song I wrote that I would like the world to hear. These are the times that music is most needed--it really does heal the wounded soul--and for that reason I make this music for everyone. Thanks to my friend Mason Kline for the audio assistance! In times of great tragedy, when words fail to heal the broken heart and the wounded soul, music speaks as a most powerful and uniting force, reminding us that there is always hope. This exciting music video showcases the opening track from Glausi's debut jazz record, "Identity Crisis". I'm pleased to announce my debut jazz record, Identity Crisis, which will be recorded this summer and released by the end of the year. This long-awaited project is a massive undertaking, and I need all the help I can get from fans and music supporters to make it possible. I have started a fundraising campaign (click to visit site) with Indiegogo—please consider making a donation! Every penny counts. Thank you! This album will feature ten small group compositions of mine, played by some of my favorite musicians: Todd DelGiudice (alto saxophone), truly one of the best living saxophone players; Greg Goebel (piano), who is really making things happen in Portland and all across the globe; Josh Hettwer (tenor saxophone), Lyle Hopkins (bass), and Ken Mastrogiovanni (drums), all of whom I play with frequently and whose musicianship and artistry are on incredible levels; Torrey Newhart (piano), Sean Peterson (bass), and Adam Carlson (drums), all of whom make up my regularly performing jazz quintet and never fail to bring the house down. Conceptually, Identity Crisis is about soul-searching, change, perseverance, and resolution. Its completion will represent a landmark in my musical career and hopefully in the lives of those whom it reaches. I'm so grateful for the financial aid and musical support I have already received and hope to see this work to a successful finish! Stay tuned for updates along the way. 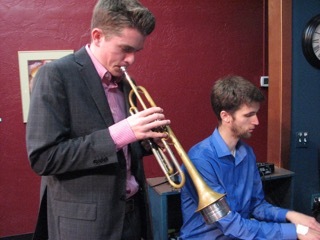 As summer draws near I am caught up thinking about the Oregon Jazz Ensemble's tour last July. Thanks to donors and the University of Oregon, the band was able travel across seas to perform at the Vienne Jazz Festival in France, the Montreux Jazz Festival in Switzerland, and the Umbria Jazz Festival in Italy. Below is footage from one of our performances in Montreux. The whole trip was full of priceless moments, many of which I caught on camera and later compiled into a travel log video. To see a play-by-play of what we were really up to, check out this video! The University of Oregon jazz department brought 4 groups down to Reno, Nevada this past weekend, stopping along the way in Cottage Grove and Klamath Falls to perform for middle and high schoolers. Friday at the festival we heard music from contemporary jazz idols such as Donny McCaslin and Randy Porter as well as a show performed by the world-renowned SFJAZZ Collective. On Saturday, UO combos I and II competed in the college combo division and OJE (Oregon Jazz Ensemble) and Jazz Lab Band II competed in their respective categories. I'm still in Miles mode after the gig last Thursday…His music is so fun and his vibe is so distinct. Miles was definitely one of the most—if the not the most—influential jazz artists of all time. Today I transcribed one of my favorite solos of his, Freddie Freeloader (click to see transcription). This is the second track off of Kind of Blue, which happens to be the all-time best-selling jazz record. Some of the most swingin stuff ever. Round Midnight from "Tony Plays Miles" last Thursday. Listen to Josh's beautiful tenor solo! Local saxophonist and composer Jessie Smith got a big band together last month and recorded her debut album, Tricks of Light, which features her original big band writing (check out the indiegogo campaign). If you like swing and latin jazz, you'll dig this record, so check back in the summer to hear the final product! Adding to what I posted last week about Jay, here is another great solo of his that I just transcribed today. I Should Care (click to see transcription) is a jazz standard that appears on Jay's 1996 album Rapture. This was actually the first recording of Jay Thomas I ever heard, and I've been in love with the track ever since. Hope you dig it! I haven't heard anyone whose time is as solid, whose tone and articulation as unique, or whose lines are as beautiful as Jay Thomas's. His trumpet playing was enough to get me hooked right off the bat—I quickly discovered his incredible saxophone and flute playing as well. Jay really is a one-of-a-kind musician. It's no wonder he's played (and continues to play) with so many of the greats. Because Jay lives nearby in Seattle I've had the pleasure of studying privately with him, going to his jams, and playing in his big band. He's a joy to work with and endlessly inspiring. I'd like to share a solo of his I transcribed a while ago that exemplifies the magic in his playing. Here is Jay on UMMG (click to see transcription) off of the album Streams of Consciousness. Below is a YouTube mp3 of this tune. There is so much information in Booker Little's sound. His time, his tone, his articulation, his lines, his rhythms, his writing and arranging... It's all there. Out Front and Victory and Sorrow (also known as Booker Little and Friend) are some of my favorite jazz records. A true jazz giant, it's incredibly sad that he passed at the age of 23. Here is my favorite solo of his: Mrs. Parker of K.C. (Bird's Mother) (click to see transcription) off of Eric Dolphy's 1961 record Far Cry. Take a look. Thanks for checking out my website. This is my first run at having a .com site. So far so good! I'll update this site weekly (gigs especially) and post on the News page every once in a while when I have something interesting to share. This time I'd like to share a little project I was recently involved in. Through a series of connections I was hired to play trumpet for a video celebrating the one-year anniversary of Facebook Paper, a popular alternative Facebook app for smart phones. At the time of the recording, I wasn't entirely sure what or who I was ultimately working for, but I did as I was told and lightly improvised over a simple folk-style melody, playing with a subdued tone. A month later I got an email with a link to the finalized video. Check it out!